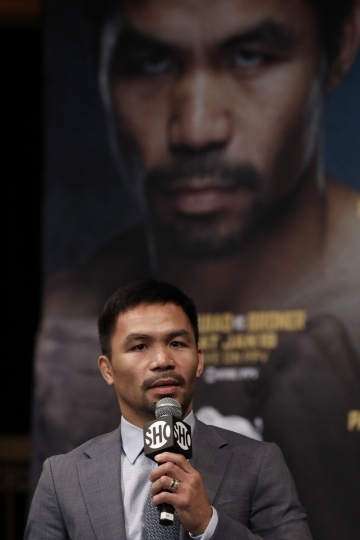 NEW YORK — Dressed in a sharp gray suit and tie, Manny Pacquiao looked every bit the senator he is. It was his other job, though, that he was working Monday when the eight-time champion announced a Jan. 19 defense of his WBA welterweight belt against Adrien Broner. 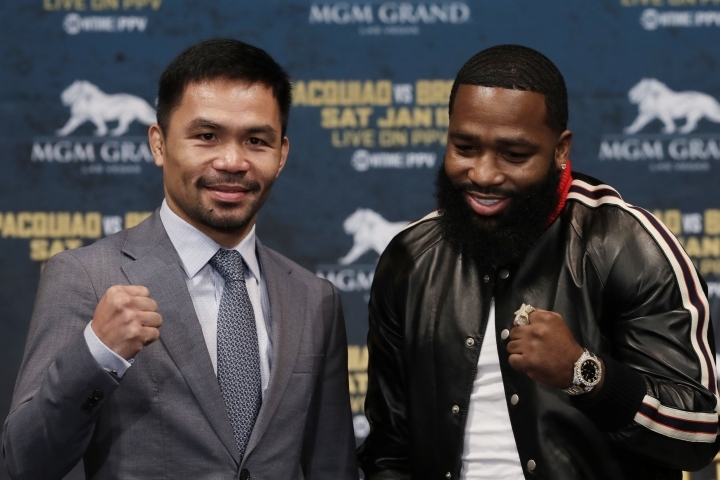 "He's one of the top boxers out there," Pacquiao said of Broner, who attended the news conference in slightly different garb: torn jeans adorned with spangles, a T-shirt and black jacket. "Adrien Broner is a high-caliber fighter. "I have no problem to fight at 140 (pounds), it's my natural weight. I can't say I am avoiding (opponents), that is not my style. I am willing to find other fighters to fight, too, I am available to fight at 140, 147. It is 147 for this fight." Pacquiao will be 40 when he enters the ring at the MGM hotel in Las Vegas to take on the 29-year-old Broner. It will be the Filipino's 70th fight in a career that began in 1995 and has included titles in weight classes from flyweight to welterweight. He hasn't fought in the United States in two years. 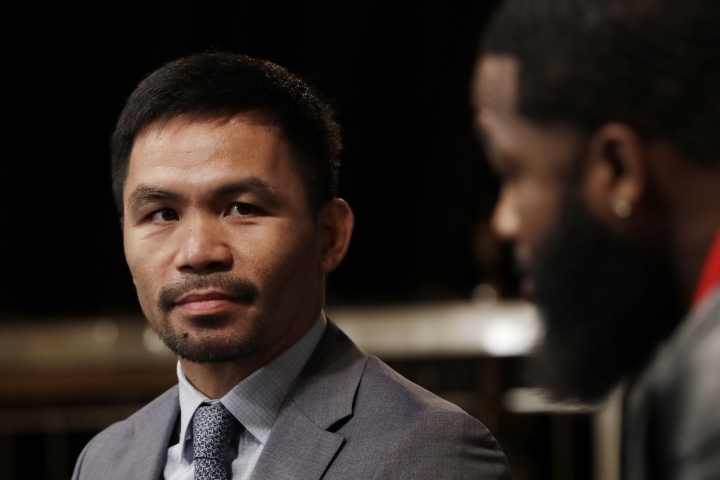 Referred to by his followers as Senator Manny, Pacquiao won and then lost the WBO welterweight crown following his lopsided loss to Floyd Mayweather in a May 2015 megafight. In July, he knocked out Lucas Matthysse for the WBA title, Pacquiao's first KO victory since 2009 when he stopped Miguel Cotto in the final round. 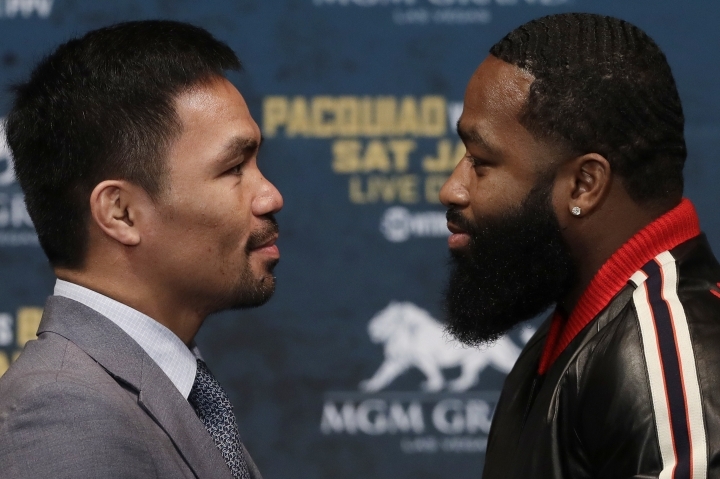 His government role will be placed aside, Pacquiao claims, while he prepares for Broner. "My opponent is fast, good, and I have to work hard and train hard so the people will be happy on Jan. 19 when we give them a good fight," said Pacquiao, who flashed a mischievous smile when asked if another encounter with the currently retired Mayweather might be in the future. 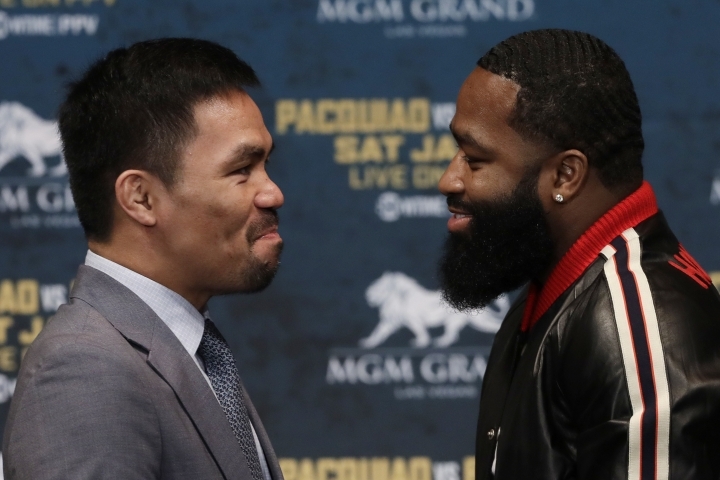 "I am fighting Adrien Broner," Pacquiao said, adding he was with Mayweather in Japan and mentioned that he, not Mayweather, owned a belt, so "you come challenge me." Broner views this as his chance to "become a legend." As he strutted around the stage, his words at first were respectful toward Pacquiao, whom Broner "dreamed of fighting when I was a kid." Soon, though, Broner was back to being Broner, the boastful, say-anything-character who likes talking trash as much as throwing leather. "He ain't fighting Floyd, he's fighting me," Broner said. "He's gotta get past me first. "Of course, things he's done in the game are unbelievable. I know Jan. 19 I gotta be at the top of my game. I'm gonna (mess) him up." Broner, from Cincinnati, is 33-3-1 with 24 knockouts. But he didn't win either of his most recent fights, losing a unanimous decision to Mikey Garcia, who won his 36th straight, in July last year, and then drawing with Jessie Vargas. Which means recent results indicate neither he nor Pacquiao is in his prime or close to it. Still, they are big enough names for Showtime to put the fight on pay-per-view television. Both men were asked if they are elite boxers now. Neither flinched in answering. "Yes, of course," Pacquiao insisted. "I want to fight the greatest opponents in the world and one of them is Adrien Broner. I can fight anybody." 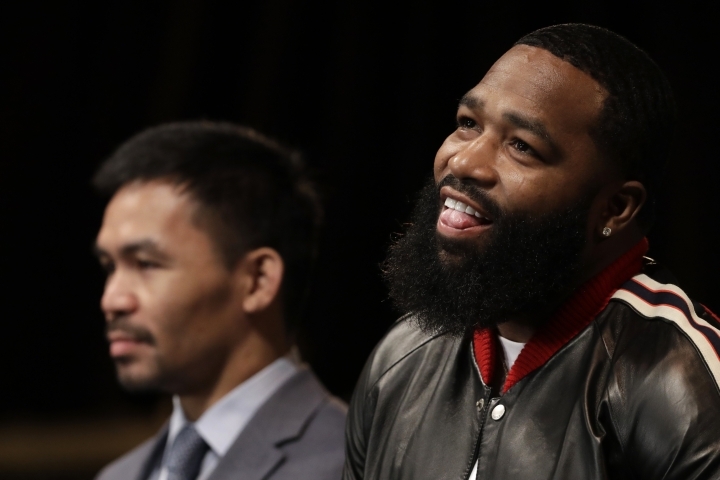 Broner shook his head and smirked when queried on his skill level these days. 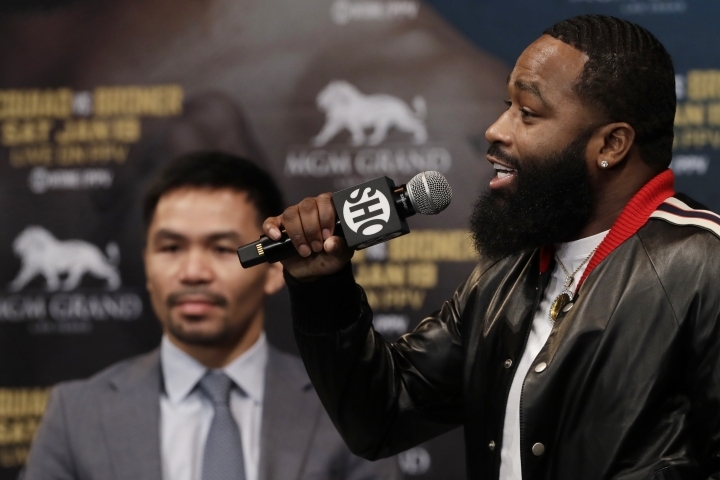 "I'm gonna do me; he's gotta worry about what I do," Broner said. "I know what he can do. "I got three losses, he's got (seven). He's been knocked out; we know he can go to sleep. I got the stuff to do it. I'll hit the jackpot overnight."